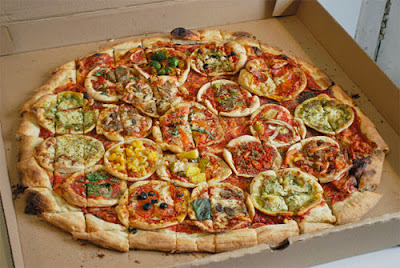 This is a pizza that would be right out of Austin Power's if Mini-me sat on the face of Doctor Evil. It's a giant pizza topped with a variety of different pizzas: Hawaiian, vegan, meat lovers, pesto nut, etc. It's truly a work of art by John Riepenhoff.